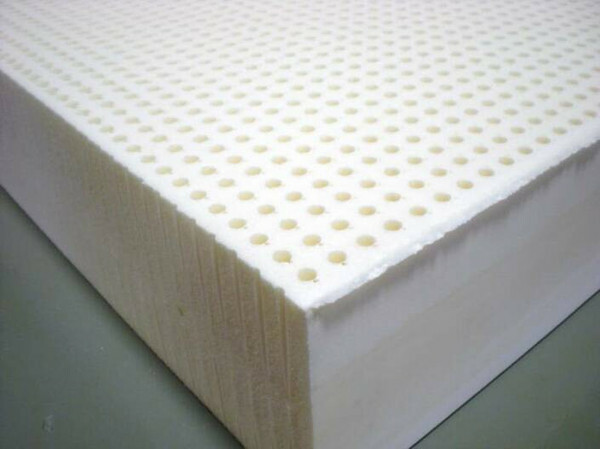 Conventional mattresses are usually made of polyurethane foam or synthetic latex which offgas VOCs. It's difficult to find out exactly which chemicals were used in a particular mattress. The worst offenders are synthetic memory foam, followed by polyurethane (though almost all polyurethane can meet CertiPUR certification which I discuss here), and then synthetic latex, which usually does not meet any green certifications on its own. Going with a spring mattress reduces the amount of foam and chemicals in it. On top of that, flame retardants like TCPP, or newer chemicals are often added, and won't be listed anywhere in sight. Look for mattresses that specify no chemical flame retardants (see my post on flame retardants). You also want to avoid mattresses that are stain resistant, as they contain harmful perfluorochemicals. Similarly, the chemical that makes sheets (and clothes) wrinkle-free releases formaldehyde. Some mattresses are also adding an antimicrobial agent which you would generally want to avoid (there are some natural antimicrobials that might be OK). I recommend all of the products here, some of which have affiliate programs and some of which do not. Update: Warning about natural latex. I am getting reports from several different people on problems with natural latex. My 3-inch piece of latex started to "melt" after about a year. Another one of my pillows became covered in grey mould after two years in low humidity, in a new non-mouldy house I was healing in. Others have noticed issues of disintegration and mould. Another blog reader has just written to me to tell me that her natural latex bed went mouldy on the underside even though it was on slats and it was not in high humidity. I have since seen many other cases of this on a forum and from people writing to me. It is not clear if this is a defect (these were all different brands), or whether there is a certain condition that leads to the latex breaking down. Below is my original post about latex and other mattress materials. I still have a natural latex sofa and so far it is OK. I would not buy it again myself. If you do buy natural latex look closely at the warranty - it's unlikely it covers mould. There are plenty of options for natural latex mattresses made in US and Canada. I have sourced the most affordable ones. (Make sure it is 100% natural latex, and test for odours/sensitivities to make sure it is tolerable). Almost all of the green mattress brands offer natural latex, you can even find this now at Costco and IKEA (with some synthetic latex in it). These mattresses range from $800 to $5000. Two of the most affordable options in the $800 range are by The Futon Shop and Organic Textiles. The most economical option is to buy a 3-inch piece of latex. For around $200 (plus tax and shipping) you can get 3" natural latex from Amazon (queen). I find that 3 inches is very comfortable to sleep on. You could also add another 3 inch layer. You might want one side medium and one side soft to see which you like better. You will need to have a cover made. People with MCS vary greatly in their ability to tolerate the natural smell of rubber and different brands work for different people. Here is a list of some of the ingredients that can be in natural latex. Essentia, which makes natural memory foam claims that the VOC levels of their foam (36 μg /m3) is about the same as that of natural latex. From my research, this is around the same levels as outdoor air - but it is not 0 VOC or 0 offgassing. The only non-toxic memory foam out there is Essentia - this is also natural latex based. They have tested the VOC levels which are 36 μg /m3. They claim that this is the same level as natural latex and this is the same as "background levels". (For reference GreenGuard Gold levels are 220 μg /m3). As for background levels here is one study of background levels in houses in Germany. Here is a study showing outdoor levels of VOCs which are around the same level as this mattress claims are background levels. This mattress also contains the following essential oils - grapefruit seed, cone flower essence, and jasmine essence. I have tested a sample and it has a noticeable scent. Though I would not say it is flowery, it is a bit sweet. Test a sample before purchasing. It contains Kevlar as a flame retardant. I went with the purest and simplest option I could find which is a 100% wool mattress from Shepard's Dream. It is a (relatively) economical choice at $1585 for a queen (I have the skinny version pictured). It does have a wool scent and is firm as it gets compacted with time. If you don't like firm mattresses I would recommend using a topper with it or using the thicker version. I would buy this again. Shepard's Dream has a referral program so if you are happy with it then you can refer others and get store credit. I would love to use their products again in the future so if you did find them through me I would love if you would mention my name, Corinne Segura. Layered wool Felt: For those with extreme sensitivities, a layered option that can be washed can be very functional. Heartfelt Collective sells wool felts that can be layered and washed. To put together what would come to about a conventional queen feel it would cost about $1900. But you may not need that many layers, or you can combine the woof felt layers with something else. Savvy Rest makes a cotton covered wool mattress for $2000. When looking at wool qualifications you may want to know about various factors, depending on your sensitivities, such as the chemicals used to process the wool and if any flame retardants are used. Certified organic wool is not that common, this link explains what it means. If a company claims all-natural, pure or eco-wool you will want to take a look at what they mean by that. My Green Mattress - A cotton and wool with springs mattress is $950 for a queen. Naturepedic - Organic Cotton & wool (with almost no smell), polyester with springs $2000 for a queen. This is a very well liked and well-tolerated brand. There is one with no wool for those who cannot tolerate wool under the kids section, but it comes in a queen for $1600. Organic Grace - Conventional style affordable organic mattresses. A queen without latex is $1800. Savvy Rest - Check out their non-latex mattress for $2000. Royal-Pedic - Makes a cotton and springs mattress (no wool) - no claims on organic cotton here. You can buy this in local stores, or on Amazon for around $3000. Soaring Hearts - Makes a well liked spring mattress with organic cotton and wool. A queen is $5000. 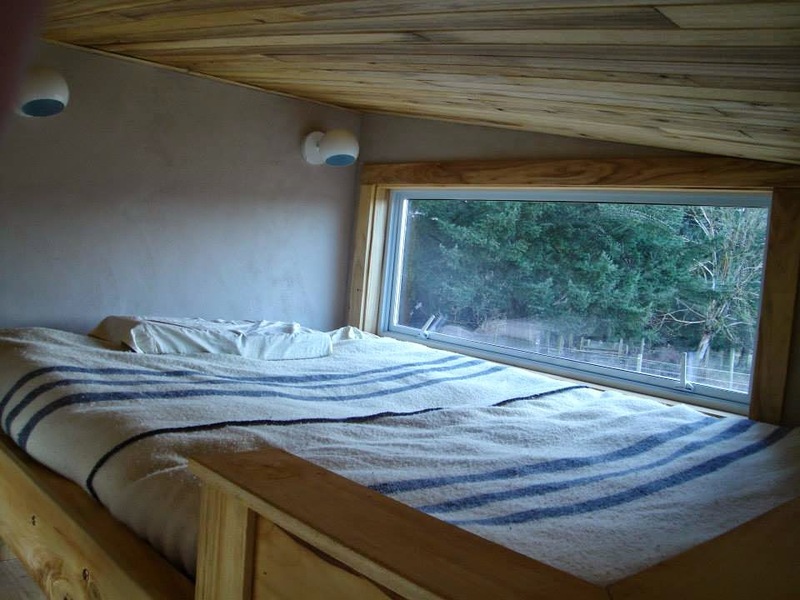 Earthsake - Makes a hemp and spring mattress with no cotton and no wool. A queen is $2600. This company will sell the organic cotton canvases and buckwheat hulls that you twist together yourself! (They don't deliver hull to Canada). A mattress topper or pad may be needed for comfort. Or, you could fill the canvas with organic cotton batting, wool batt, or even recycled wool sweaters, and use the same twist system to make your own true DIY chemical-free mattress! Futons are more affordable and often don't use flame retardants. Look for organic cotton or wool filled. 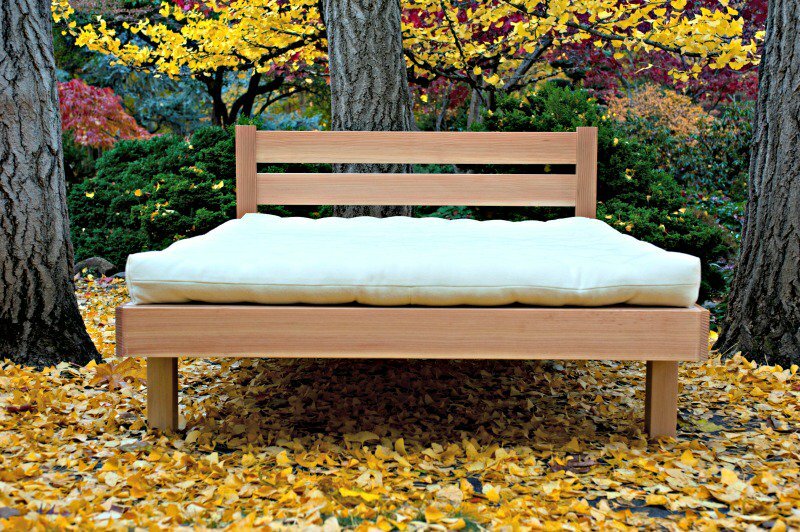 Another cool option is kapok fiber futon which they claim does not compact as much as cotton and wool (coupon code 1021 for 5% off). Avoid conventional cotton batting which still retains a lot of pesticide. Look out for antimicrobial and even added pesticide treatments. I have seen silk filled mattresses in the past, though they are hard to locate. May be good if you cannot tolerate cotton, wool, kapok or latex. Silk mattress toppers are easier to find and you could build them up to make a mattress. This organic cotton mat is thin but may be enough for some people who need a simple solution. Or for a quick and easy solution maybe a camping cot will do! Let it offgas a bit first. The plus side is there is not much to offgas there, so some time in the sun should do it. For sleeping pads there are the basic foam ones, this aluminized Thermarest one being the most tolerable, and then there are the polyurethane self-inflating ones. I use the most deluxe Thermarest the 10 cm thick Mondoking, (it has polyurethane it in). I find it very comfortable. It takes a bit of time in the sun to offgas but many MCSers can use these. I used it after two days in the sun. After a week it was ideal for me. The general consensus for those with sore backs or who need the most comfort is a Thermarest on top of a camping cot. Though with the Mondoking you likely don't need a camping cot under it (though I would raise it or put a waterproof cover on it). Another kind of simple sleeping mat is a Nufoam polyester fiber mat. This may be more tolerable than the camping pads that have polyurethane, plus I find polyester does better with moisture than cotton and other more natural materials. This phthalate and PVC-free TPU air bed by Lightspeed comes highly recommended by many extremely sensitive people. I found it offgaseed in 2 days. Another option for PVC free airbed is this polyester bed from Intex. These solutions can be used inside for those with trouble tolerating regular beds or they can be used in high moisture places like tents and simple trailers or emergency shelters. For pillows you generally want natural fibres like wool or organic cotton. Kapok, or buckwheat are also good options. Never use non-organic cotton batting as the bats retain a lot of pesticides. Organic cotton batting sometimes still retains a strong smell from the oils of the cotton plant. I do like polyester because of it's more moisture resistant. I use this organic cotton pillow with polyester filling, but it still needs to be washed or aired out before use. This pillow with organic cotton filling is GOTs certified (chemical-free). I have one and it did have a strong cotton oil smell at first which aired out quickly. It also has a zipper so you can wash the case or pull out the cotton itself to wash it. 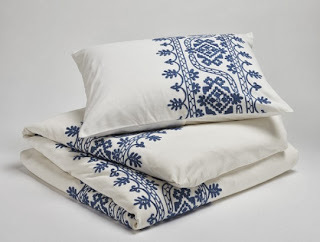 Coyuchi also makes organic sheets, pillows and other bedding that is made with the chemically sensitive person in mind. I highly recommend this company. They use natural dyes but the safest bet is always virgin fabric. If you react to the product you can return it. I've been really happy with all their products. (Also available on Amazon). Cotton that has been processed into fabric (sheets, pillow cases etc) no longer contains pesticides in theory. But stay away from permanent pressed finish (wrinkle-free finish), and make sure the dyes are steadfast or all natural. Almost all cotton that is not organic has a chemical added to it and smells bad. Look for GOTS certified fabrics which is the best certification for non-toxic textiles. I use GOTS certified sheets which usually need one wash to get the smell out (probably the smell of cotton oils). I use these pillowcases. In a high moisture environment like a trailer, I use all polyester sheets and pillowcases. If you have an old mattress and you want to block flame retardants from migrating out of the mattress, use a cover like Organic Lifestyle's Bed Bug Cover which is also waterproof and will protect you from dust mites and bedbugs. It has a pore size of zero. The polyurethane smells strong to me but after a lot of offgassing I found it to be good. Polyethylene covers are the least toxic but do not hold up very well after washing. There are polypropylene covers as well, they hold up a little longer than plain polyethylene. This cover is a mix of polyethylene and polypropylene and is reported to be very tolerable by someone very sensitive to plastic. They do not stop the offgassing from foam or scents that a mattress has picked up, unfortunately. If you do not have a choice but to use a offgassing or fragranced mattress and you want to block the smell you will have to cover it with Mylar (though those become dust quickly), the Mylar bags hold up longer but are harder to tape onto a bed. My preferred method to block offgassing (and protect from contamination) is using aluminized tarps and tape. If you just want dust mite covers (that are not waterproof, and don't block flame retardants), I use these mattress and pillow protectors (non-organic but were good for me after one wash, I'm really happy with them as they have reduced my allergies). I use wool blankets from Coyuchi - the natural colour with indigo stripes. It does have a wool smell, so if you are sensitive to wool try their cotton blankets. I really like wool because it's hard for me to stay the right temperature at night without them and I slept with the window open when my house was new. The wool blankets were a super good investment in my case, as they stopped me from waking up throughout the night due to being too cold. The wool blankets are difficult for me to wash so I also tried an organic cotton blanket (this is thick and takes a long time to dry) and polyester blanket (cheap! from Walmart or Amazon). Both needed one wash at least. A metal bed frame that is powder coated would be a great option. This metal bed is inexpensive for a twin on Amazon. 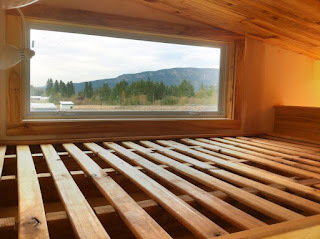 Or, if you can tolerate the natural smell of wood, go with a solid wood bed frame, with solid slats (not laminated), finished with a natural finish. For wood frames check out Organic Grace which has simple frames for $780 (queen, ships from the US). 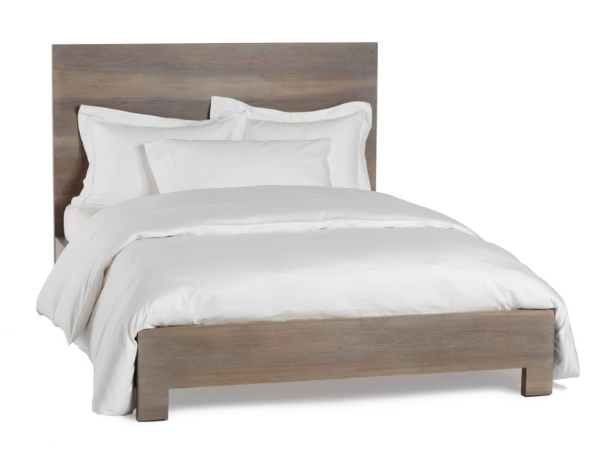 For cool wooden headboards and frames with zero-VOC finishes check out Coyuchi (pictured below). For something really simple and cheap this healthy Nomad Solid Hardwood Platform Bed (around a hundred for a twin) on Amazon is made of low odour poplar with solid slats. IKEA sells solid wood frames but the slats are laminated. They claim the glues are "non-volatile and non-polluting". 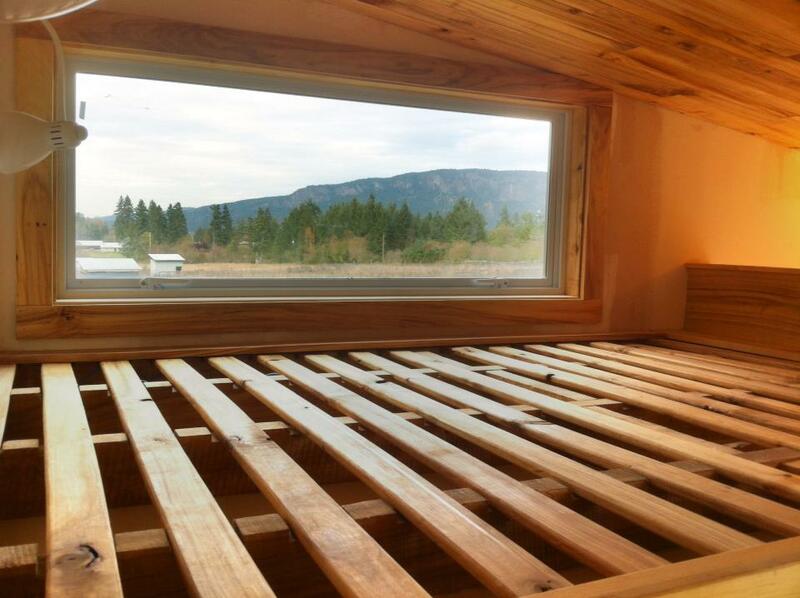 When building a tiny house, find a way to incorporate slats under your bed. I see too many tiny houses with the mattress on a solid floor. This is not a good solution if you want your bed to stay mould-free. This is my loft on the left. The slats are built right into the loft. It works great! In any house or trailer tiny or big make sure your mattress can breathe underneath (slats or box springs are used for a reason). Only certain types of beds like an air mattress may be able to go straight on the floor. When camping I do think a waterproof cover is the best idea, in a trailer you may be able to use something simple like this for airflow, though I have heard that that is not enough airflow in many situations. Good info, if we can ever help out any of your east coast customer we would love to www.theorganicbedroom.com. Hi,Joe from Nest Bedding! Thanks for the link. So, here are some hopefully helpful comments. My friend Lynne makes the twist buckwheat mattress, but that $300 is for the covers only, you still have to buy the buckwheat and stuff them. They are very firm. The Shepherds Dream mattress is very nice and also very firm. Latex is a good option for those who like a little comfort as well as support. I have recently added USDA certified organic latex and talalay to my product selection. Thanks for the info Joe! Look forward to checking out the samples from Nest Bedding! Excellent ideas. I am worried about latex. I know everyone says it's non-toxic to MCSers, but latex gloves smell and there are so many people with latex allergies. I can say "well, I'm not allergic to latex" and not care, but that would be like my neighbor bathed in perfume and saying "well, I'm not allergic to perfume so why should I care about you?" I like the idea of the mattress pads piled on top of each other. Does anyone have personal experience with this. I like the idea they can be washed in a washing machine. Beds harbor all kinds of dust, dust mites, and maybe mold. It would be cool to be able to wash a bed! Hi, there's a big difference between natural latex and synthetic latex rubber. The natural one still does have a rubbery smell but it is dissipating with time. I don't believe that it is technically toxic though natural scents bother many people. I'm loving the all wool mattress, It's very firm but Im sleeping so much better than I was when I was breathing flame retardants all night. Who did you use to make the custom latex cushions for the couch you had built? just re-sizing mattresses from nest bedding. will then get a dressmaker to sew the cushion covers. Thank you for sharing! Very helpful information! I tend to wool mattresses (very simple and natural solution, and I always have more confidence in nature than in technology). My search shows that wool mattresses are very expensive, but I found an Etsy shop: https://www.etsy.com/shop/TheHomeOfWool which I liked very much. Very affordable and trustworthy. I look for reviews. It would be great if someone could help! Gotta ask yourself why so many comments have been deleted by the administrator. Talk about lack of transparency. it's all Spam. Major spam. Very informative information. This definitely helps us in our search for chemical free bed. Thank you. Thank you, I will update this. The Clean Bedroom reopened last fall under new management. I'm surprised at some of the inaccurate information on here. Essentia has a history of false advertising. I have a natural organic latex mattress from an online company with GOTS, Okeo-tek certification and it has absolutely no smell. True latex shouldn't have an odor. Nest Bedding has some quality control issues. If you do a thorough search on the internet you'll discover the problems. I'm also suspicious about the objectivity of people that review mattresses when they are getting free samples and a small commission. Too many bloggers are selling themselves out to the mattress industry and promoting false information based on questionable marketing tactics. I have sampled 4 different brands of natural latex (that is meant for bedding) and it all has the same rubber smell. If you are not super sensitive you may not smell this. I have MCS and this blog is written for people who have a heightened sense of smell as well. Essentia used to say they are zero-VOC - their levels are 36 μg /m3. The same as natural latex. If you ask most naural latex companies if they are zero-VOC they will also say that they are. I agree though Essentia should have stated this level and now they do which is an improvement. It is actually rare for a company to disclose the actual VOC level of a foam so I respect them for doing that and not just saying low-VOC. I don't believe there is any false information on this post, please be specific if there is false information. I received some samples from Nest and Essentia to tell people what kind of smell it has. Whether a company has an affiliate program or not only comes in after I have chosen the products that I recommend. I am now checking out Nest Bedding and realizing they have completely changed their products since I wrote this post. They used to sell simple natural latex with covers. I will update this post regarding Nest. May i ask which online company you chose...i am hunting for a company i can trust and am so confused! I used Shepards Dream for an all wool mattress and Coyuchi for blankets. The Amazon pillow I listed is what I use for a pillow. Simple GOTS organic sheets are from Amazon as well. What bedframe do you have? I have wooden bed slats custom built into the loft area. I'll post a pic in this blog post. Have you trust its? are You help me? This is great information, and pretty much the same conclusions I reached after years of research and bad choices (like a latex rubber mattress to which I reacted.) Now I am in Italy and the choices are different. I am trying to decide between a solid natural wool mattress with cotton cover (they do not use antiflame treatments with wool, thankfully) or a traditional mattress which has springs in the center and about 2 inches of wool surrounding them on all sides. I'll see if I can send you a picture. Since Baubiologie started in Germany, I wonder if they have similar choices there and have any discussion in your classes on this kind of traditional mattress? Springs with cotton is good. Building Biologists are against springs because of possible EMF issues. I am no concerned about that. I think you would have to be extremely sensitive to EMFs for that to be on your radar. 100% wool is good and yes it is very compact. I use a 3inch wool mattress and it's FIRM. Sometimes my arms fall asleep but not enough for me to change it! It's find on wooden slats if you don't mind super firm. But something springy is a good idea. A topper can help but then again I'm not for any type of foam. I don't recommend these. The reason is in the post. Please read the post before posting ads. I am a Sr w/ severe MCS ( detergent on other's clothing bothers me) as well as all petroleum & usual cleaning & body care products. A foam mattress in the 90 started the MCS. A wool or futon mattress is too firm. what choice or choices do I have? Aren't mattress toppers foam? Help. You can find all the options in this post. I would go for a spring mattress from the ones I mention. Also check http://reviewkid.com/tag/organic-mattress/ as well. That is polyurethane. Quite misleading. Hi! Thanks so much for the great info!! Is there a reason you didn't look at Rubio Moocoat? I mention it in the post on sealers. needing the support shape up under the neck? No answers coming my way???? If you don't find one on Google you may have to try and custom make it. Hi Corinne! You wrote "Poplar wood on the interior too (should have used maple)." Why would you prefer maple over poplar? (I ask because I'm chemically sensitive, and am looking at a new Dapwood bed that has poplar slats). Is poplar prone to mold? Thanks! It's fine for a bed. It's just hard to work with when you are building anything. Metal bed frames are safe? What about EMFs? I just read about this somewhere. Please help! Hi thanks for a ton of great information. The more I read through this article to more I realized that the bed that my husband and I sleep on fits the description - solid wood frame, natural latex mattress, pure and untreated sheep wool, not metal in our bed. It is great that you put so much work into this article to educate others! It seem that our bed may be a good fit for you as well. Take a look at www.swissdreambeds.com. I hope it helps other as well. We really love it and always dread going on vacation unless its is relatives that have the same beds as we do! Other companies got in big trouble for claiming natural latex is 0 VOC. Plus how can it be natural mould resistant when it's so prone to mould? Unfortunately there is little oversight to what companies claim.